Started in Parma back in 1971, in agreement with the main constructors of the time, the Trofeo delle Industrie has already lived 42 editions and is still organized by Parma Karting. 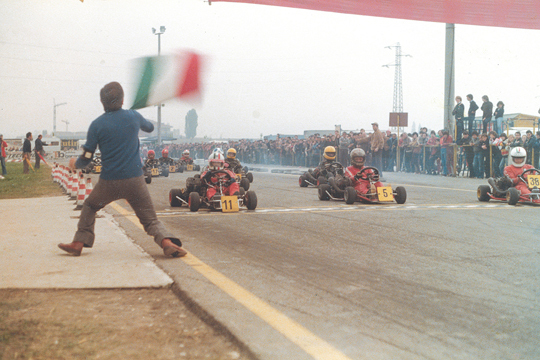 The “Trofeo delle Industrie” is the oldest karting race in the world. It is organized by Parma Karting as the most full of history and glorious karting race. Among the numerous protagonists that started their career at the Trofeo delle Industrie, several have kept their momentum becoming great names of the main formulas of motor racing. Everything started back in 1971 from an initiative of the Parma's Kartodrome owner Umberto Pellegrini, who has made the circuit of Emilia become the fulcrum of international karting organizing several Italian as well as European and World Championships: precisely, 37 Italian, 4 European and 5 World championships. It was not by chance that Umberto Pellegrini used to call his track the “Mondial... track!”. The tradition of the “Trofeo delle Industrie”, as well as that of the other big event taking place in Parma, the Andrea Margutti Trophy, is still lively thanks to the commitment of Umberto Pellegrini's children Tiziano, Donatella and Germano. The first edition of the “Trofeo delle Industrie” was organized in 1971. It involved 4 rounds, that became 5 in 1974 and then 7 in 1984, 1985 and 1986 due to the high number of entered drivers. From 1987 it went down to 5 rounds again and then to 3 for several years and finally to 2. From 2009, due to the decommissioning of the Parma Kartodrome, the event started featuring only one round. Year 1988 was Jarno Trulli's turn to claim the victory at the end of a good challenge with Giancarlo Fisichella, then Fabrizio De Simone (1988), Gabriele Lancieri (1989), as the latter is currently a Federal School instructor. At the beginning of 80s, other drivers have also been racing at the trophy before becoming important constructors like Roberto Robazzi, Albino Parolin, Jorn Haase, Michele Panigada, Roberto Ninzoli and Giuseppe Cavaciuti, or future team managers like Dino Chiesa, Armando Filini, Pietro Sassi, Sandro Lorandi or Guido Cappellini, who became motorboating champion. Others owned circuits like Francesco Calzavara (owner of Jesolo's track), Fabio Torsellini (Circuit of Siena), Marco Corberi (South Garda), Massimo Wiser (Pista Winner), Matteo Grassotto (Pista Friuli Venezia Giulia). A very good interpreter of the Trofeo delle Industrie was also Andrea Margutti (1988). 90s started with Giancarlo Fisichella winning the Absolute Title of the 100 International in 1990. Andrea Belicchi won the Trophy in 1991, year that saw Tonio Liuzzi's presence in 60 Mini and that of Ronnie Quintarelli. Some journalists also took part in those years at the Trofeo delle Industrie, such as Giovanni Paterlini, Maurizio Voltini and Alberto Sabbatini in 1991, who is Autosprint's director, and Fulvio Cavicchi, who is the son of Carlo Cavicchi, Autosprint director first and then Quattroruote's. Among the main names of the 90s, Giorgio Pantano, Thomas Biagi, Alessandro Sferrella, Raffaele Giammaria (1993), Fabio Francia (1993), Francesco Laudato who won the Trophy back in 1995, Fernando Alonso in 100 Junior (1995), Marco Ardigò and Stefano Fabi both in Mini (1995), Alessandro Balzan, Alberto Pianta, Alessandro Manetti (1996) and the several times winner Danilo Rossi (1996). Among the girls, Ketty D’Ambroso managed to shine in 1997 and before winning the 2004 edition of 100 ICA. Among the protagonists of the Trofeo, three drivers went all the way to become Formula 1 World Champions: Fernando Alonso (2005-2006), Lewis Hamilton (2008) and Sebastian Vettel (2010-2011-2012-2013). In the nineties, the number of drivers partaking in this event became quite remarkable, with the record of 261 entered drivers in the first round of 1993, and a total of 718 drivers in the three races run in that year. Daniil Kvyat made his debut in Mini together with Antonio Giovinazzi in 2005, while Mini's debut for Carlos Sainz Jr came in 2006, when he ended fifth in final one ahead of Kvyat. Aaro Vainio got the win in 2007's edition of the race in KF3. The 2008 Absolute Trophy went to Daniil Kvyat, who won in KF3 ahead of Antonio Giovinazzi and Raffaele Marciello. The “Trofeo delle Industrie” relocated to Pomposa in 2009 and was run in one round only. The race moved to Castelletto di Branduzzo in 2010. After a sabbatical year, the race restarted regularly at the South Garda Karting circuit of Lonato. Davide Forè won the trophy in 2013, in KZ2, repeating the success he had in 1989 in category 100 Italia. The winners of the other categories in 2013 were Nicola Abrusci in Mini, the Russian Alexander Vartanyan in KF3, the Briton Callum Ilott in KF2 after previous year's win in KF3.